1. An open-bore MRI machine is bigger and roomier. When it comes to headroom, Shields’ 70 cm openings are wider from top to bottom than the classic 60 cm MRI bore. For a claustrophobic patient who needs a head scan, this means the machine is going to be 10 cm further away from their face -- a big difference! 2. Shields' open MRI scan time is up to 8x faster than it would be on a true open machine. Our 1.5T and 3T open MRI machines provide faster results and reduce patient exam time, which really matters to claustrophobic patients. 3. Diagnostic ability is better with an open bore. 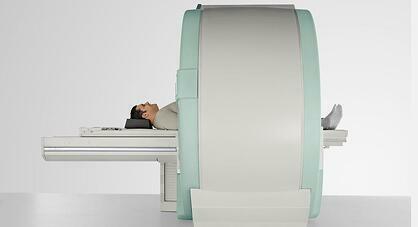 The more open space in an MRI machine, the harder it is to capture a clear MRI. A scanner that is open all the way, sandwich-style, is less powerful (only .6T, 1T or 1.2T) than Shields' open-bore machines, and cannot produce as high-quality an image. 4. Better image clarity means fewer repeat scans. Imagine telling a claustrophobic patient that they need to sit through another scan because of image quality! Shields' open MRI machines are fast and provide superb image quality -- one and DONE! 5. Most MRI scans can be done with the patient's head outside the machine. Because our open bores are also relatively shallow, most MRI scans can be done with the patient's head outside of the scanner (with the exception of neuro / brain MRI, obviously). That's not possible with sandwich-style open MRI machines -- no matter what body part is being scanned, the patient's head is almost always inside the "sandwich." The patient pictured below is able to have both his head AND feet outside our scanner due to its short bore length. 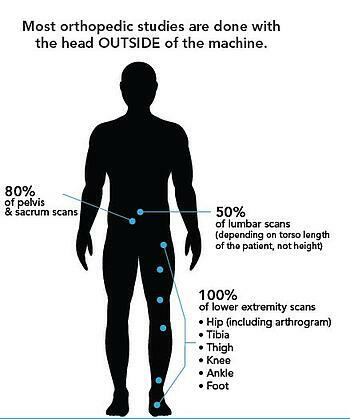 The below body map is a guide to some common scan types where the head stays outside the machine. Shields has more than 20 OPEN MRI MACHINES across Massachusetts-- we've got you covered from Springfield to Worcester, to Boston and Yarmouth...and everywhere in-between! Call 1.800.258.4674 or visit www.shields.com/open to find a location near you.